WE’RE NEW. FRESH. BRIGHT. CREATIVE. Fabulous original flowers under the nurturing bloom of professional Florist Nicola Byrne. Free delivery all across Dublin! We don’t just bring you flowers. We bring you flowers and we don’t charge delivery in the Dublin area. We bring you flowers infused with colour and imagination. We bring you flowers shaped by design expertise so that you can shape a smile into someone else’s day. With her international floristry experience between Spain and Dublin, managing florist Nicola gathers the best of all that – warm Mediterranean colour and a cool eye for creative detail, along with a bright team of co-workers. 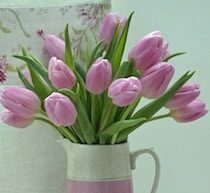 Like Lollipops – or sweeter still – a bunch of Tulips in a jug! Simplicity is key in our customer commitment to you. Take the freshest and brightest flowers of the morning. Create beautiful original floral designs. Our online ordering system is user-friendly, hassle-free and secure. Next-day-delivery is FREE all over Dublin.